Although the village has grown over recent years, attracting inward migration from the rest of the country, the people who settle here tend to stay for the long term and are then keen to promote and preserve the local history and heritage. 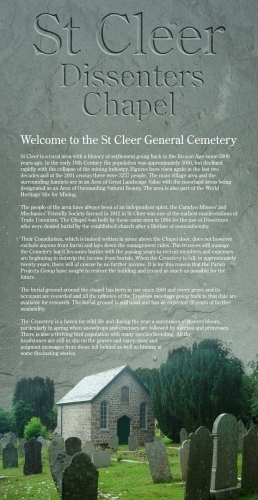 The people of the area have always been of an independent spirit, the Caradon Miners’ and Mechanics’ Friendly Society formed in 1842 in St Cleer was one of the earliest manifestations of Trade Unionism. The Chapel was built by these same men in 1864 for the use of Dissenters who obviously had no wish to be buried by the established church after a lifetime of nonconformity. The trustees managed to maintain the Chapel but after 140 years major works became a necessity to ensure its survival. St Cleer Parish Projects Group therefore decided to submit a Heritage Lottery funding bid in order to enable us to complete the work. The burial ground around the chapel has been in use since 1860 and every grave and its occupant are recorded and all the minutes of the Trustees meetings going back to that date are available for research. The burial ground is still used and has an expected 20 years of further availability. The Cemetery is a haven for wild life and during the year a succession of flowers bloom, particularly in spring when snowdrops and crocuses are followed by narcissi and primroses. All the headstones are still in situ on the graves and carry clear and poignant messages from those left behind as well as hinting at some fascinating stories. We feel that we have a unique and precious part of the local heritage story in this Cemetery and its Chapel which is well worth preserving for time to come. St Cleer General Cemetery Dedicated on the 26th day of July 1864 to the use of the various Religious Dissenting Denominations in the neighbourhood, and the public generally.PURCHASED AND WORKED by voluntary contributions and profits arising from the sale of graves MANAGED by twenty trustees who are bound to present the accounts to an annual meeting. If at any time, profits above the working expences should arise, the Public , not theTrustees to have the benefit of the same.